this post on the best times to go to Disney World. 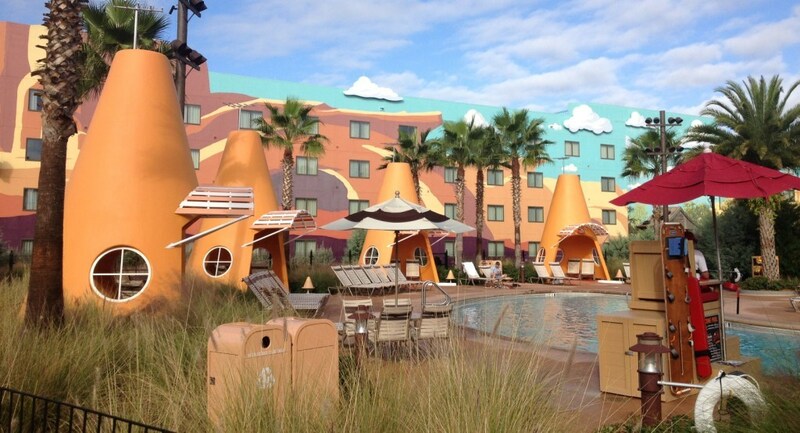 What’s the best Disney Value resort? I have stayed at all five of the Disney Value Resorts in Walt Disney World and while I love the overall experience at these resorts, there are definitely some highlights and lowlights! I’ll explain my ranking next with lots of detail and pictures! I’ll start with #5 and work up from there. 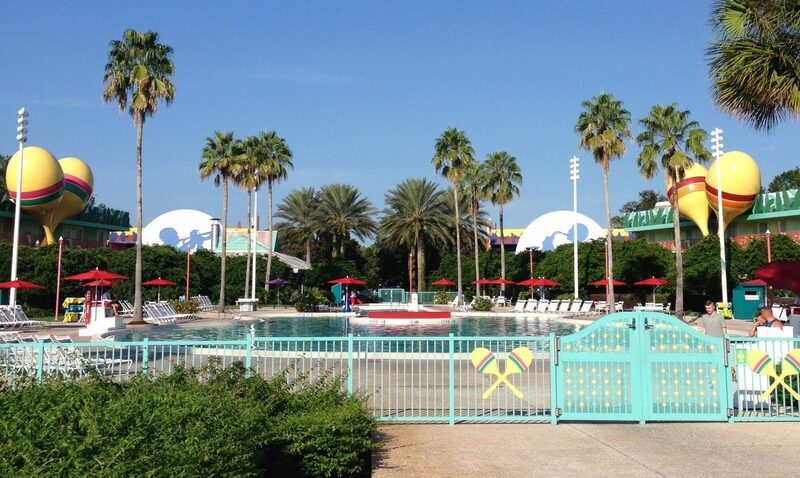 The two oldest Disney Value resorts are All-Star Sports and All-Star Music, both of which opened in 1994. It is probably no coincidence that these are (in my opinion) the worst of the Value Resorts. The rooms at the All-Star Resorts all look pretty much the same, though some details are different. They are all 260 square feet and have two double beds or one king bed (only in accessible rooms). Each room has a small table with two chairs, a mini-fridge, and some storage around the TV. I’ve had roughly the same experience in each of the All-Stars, which is that the rooms are showing some wear, but are overall in good condition and work great if you are spending most of your time in the parks. 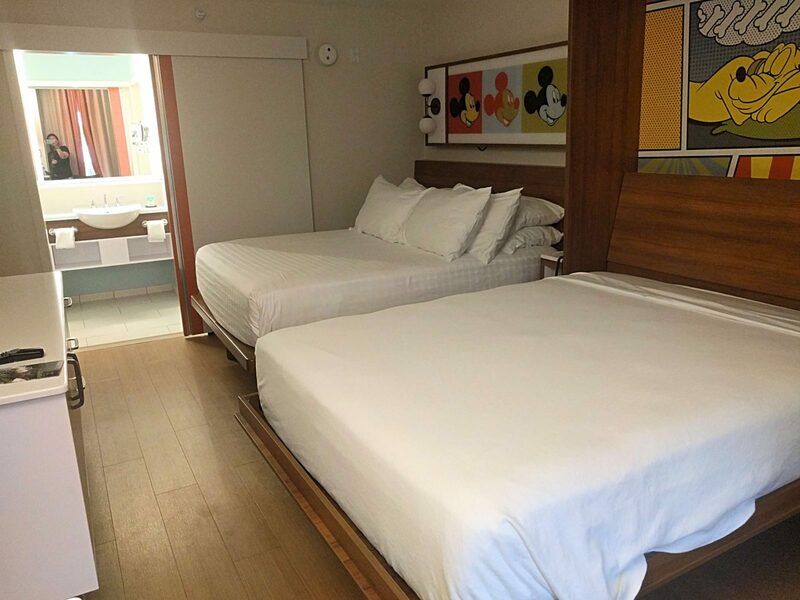 The All-Stars are scheduled to have major room refurbishments in 2019-2020, and the new rooms will look similar to these refurbished rooms at Pop Century. While the rooms, dining, and layout of the All-Star Resorts are similar, it’s the theming and details that set them apart. All-Star Sports is definitely the least “Disney” of the resorts because the icons are all sports-inspired. You’ll find a few Disney characters scattered about, but it just doesn’t have the appeal of any of the other Value Resorts (unless you or your kid are a total sports nut, in which case you might prefer it over the other All-Star Resorts). I like the theming at All-Star Music much better than Sports. 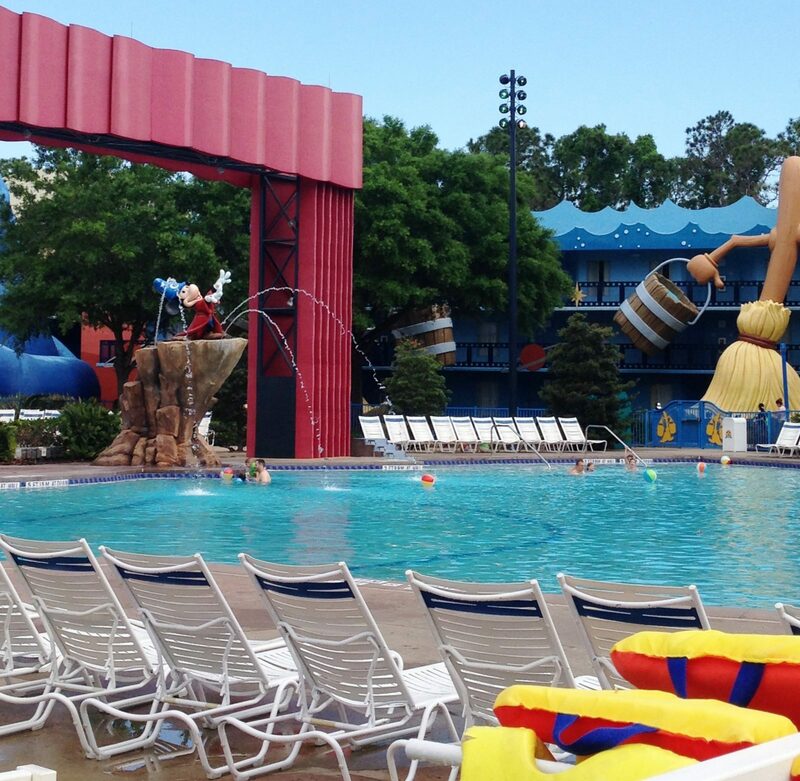 There’s more of a Disney presence, such as statues of Donald and friends at the feature pool and Ariel at the leisure pool. The courtyard that you walk through in the jazz section of All-Star Music is really lovely. All-Star Music has two-room family suites that can be a more affordable alternative to the suites at Art of Animation (more on those later). My favorite All-Star Resort is definitely All-Star Movies, which opened five years after the original two All-Stars. 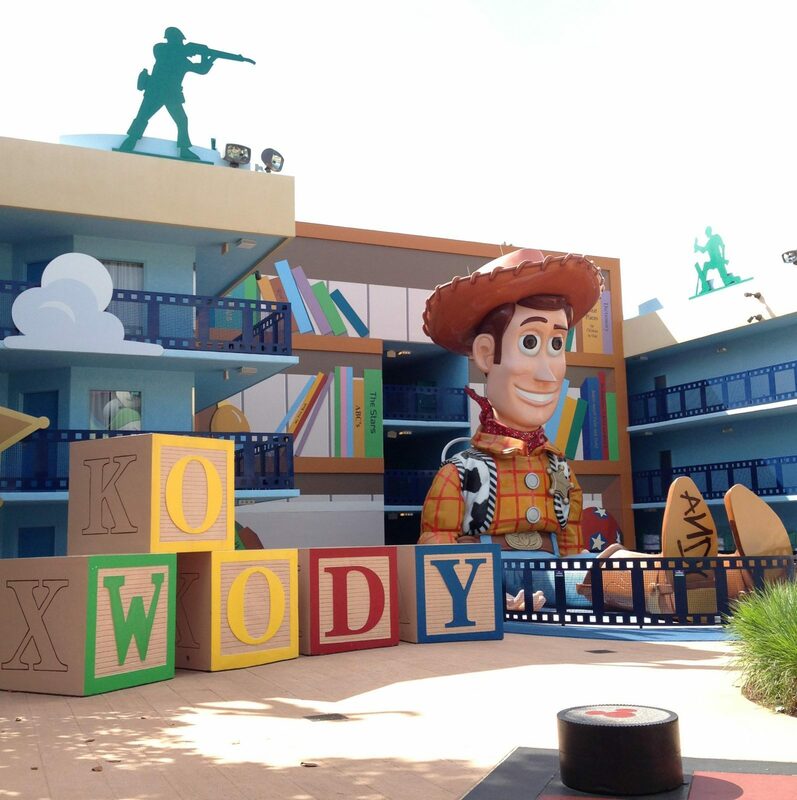 The Toy Story section of the resort is fantastic, and we will walk over there to visit it even when we are staying at another All-Star Resort (you can easily walk among them). 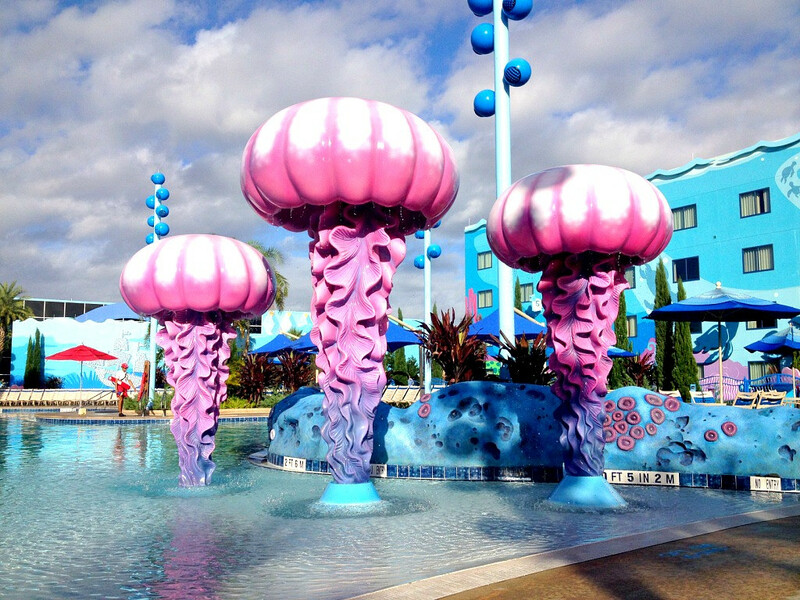 The main feature pool is inspired by Fantasia and it has an excellent kiddie pool area with some fun water features. Overall the resort has great theming, though you have to wonder why Imagineers dedicated sections of the resort to the movies Herbie the Love Bug and The Mighty Ducks. 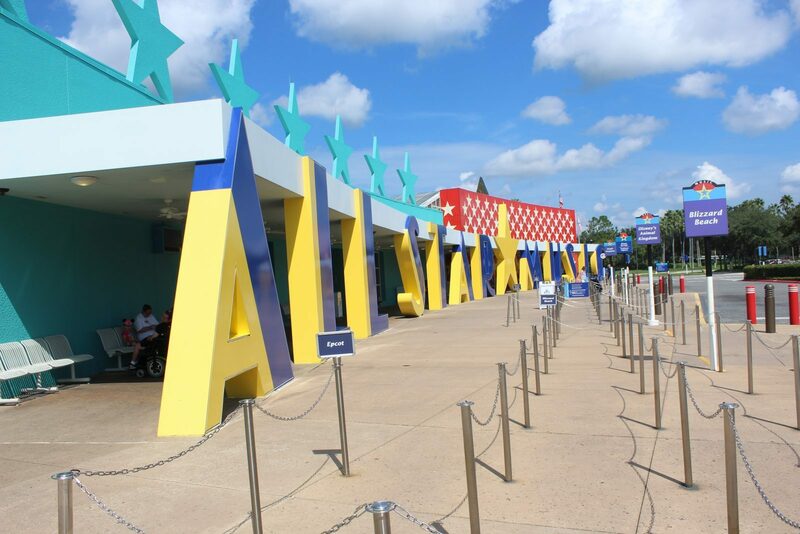 Because of the better theming, kiddie pool, and Toy Story area, I suggest All-Star Movies over the other All-Stars for families with little ones. In my experience, the food, cast members, and transportation have been similar at the three All-Stars. You may read that these resorts share bus service to the parks (every bus stops at all three resorts), but I’ve found that for the most part that doesn’t happen. At peak times you will always go straight from your resort to the parks without any stops. 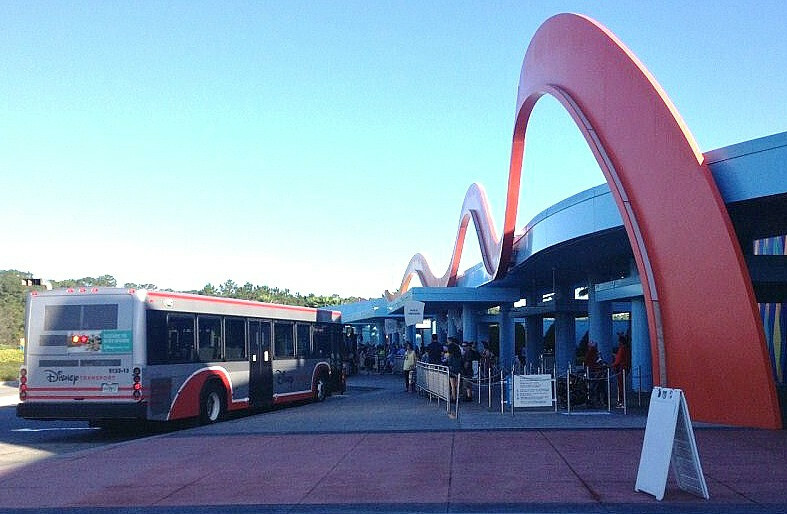 Each resort has its own bus stop at the Magic Kingdom, so you will go straight back to your resort from there as well. The only time you may experience multiple stops is if you are going to the parks at a non-peak time (such as a 3 p.m.), or coming back from Epcot, Hollywood Studios, and Animal Kingdom. Before I move on, I have to point out two advantages of the All-Stars compared to the other Disney Value Resorts: price and availability. 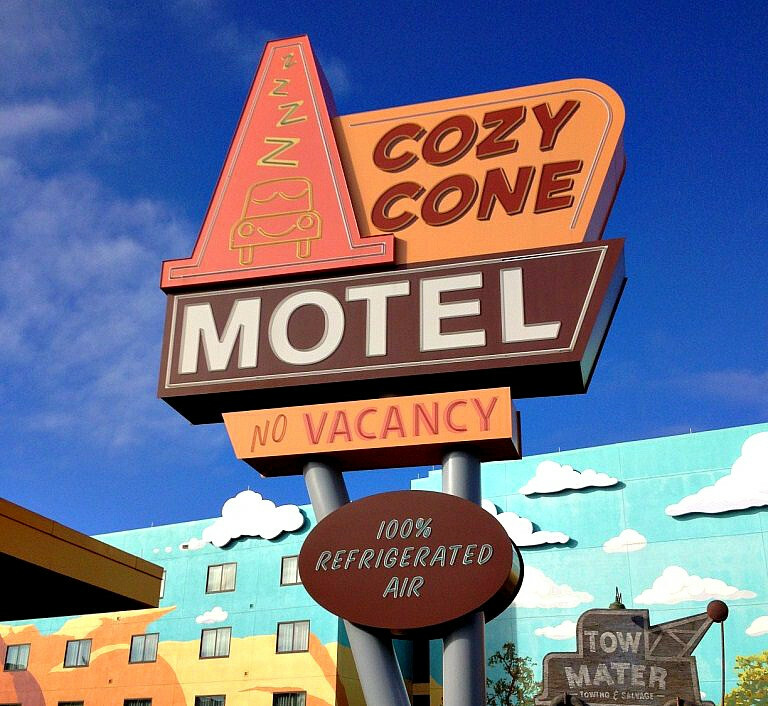 You will pay slightly less compared to Pop Century, but only about $10-$15 less per night. The All-Stars are some of the last of the Disney Resorts to fill up, so you may be able to find rooms available there for a last-minute trip. I’ve booked rooms at the All-Stars for as little as $85 per night when I combine Orbitz promo codes with Disney discounts. I’ve also been able to score a room at All Star Sports for as low as $48/night by using Hotwire – get the details here. 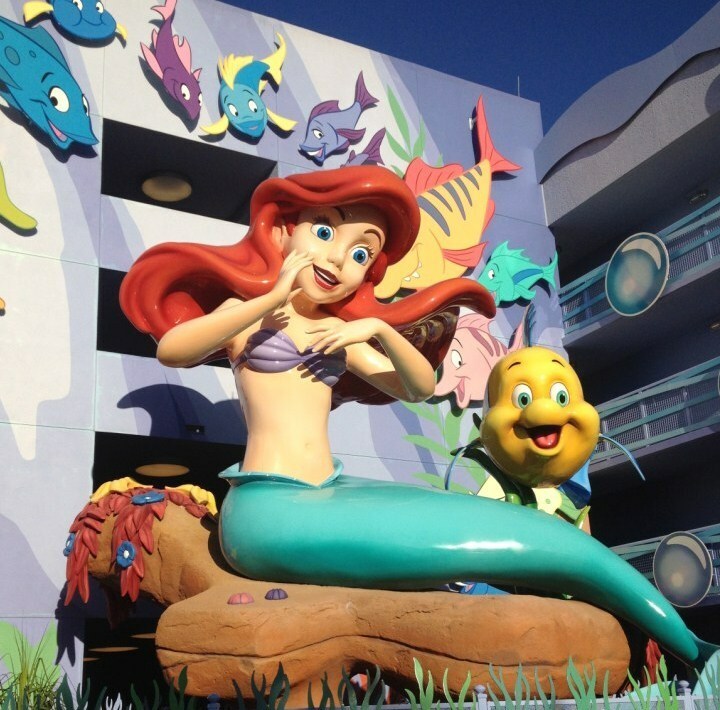 The two other Disney Value Resorts are Pop Century and Art of Animation. These are by far my favorites, and which resort I prefer depends on who is in my travel party. 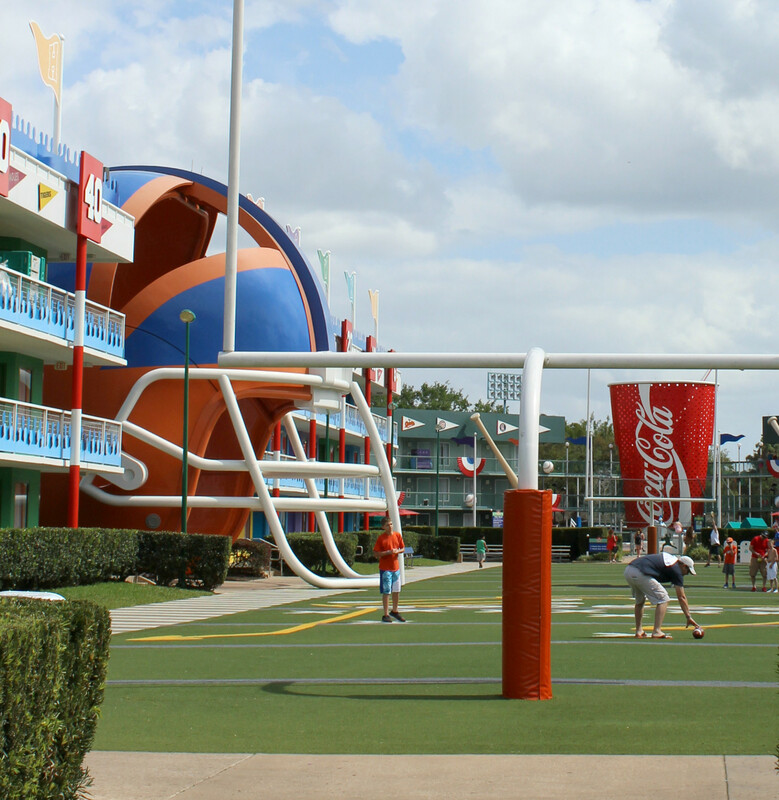 My first pick for the best Disney value resort is Pop Century. 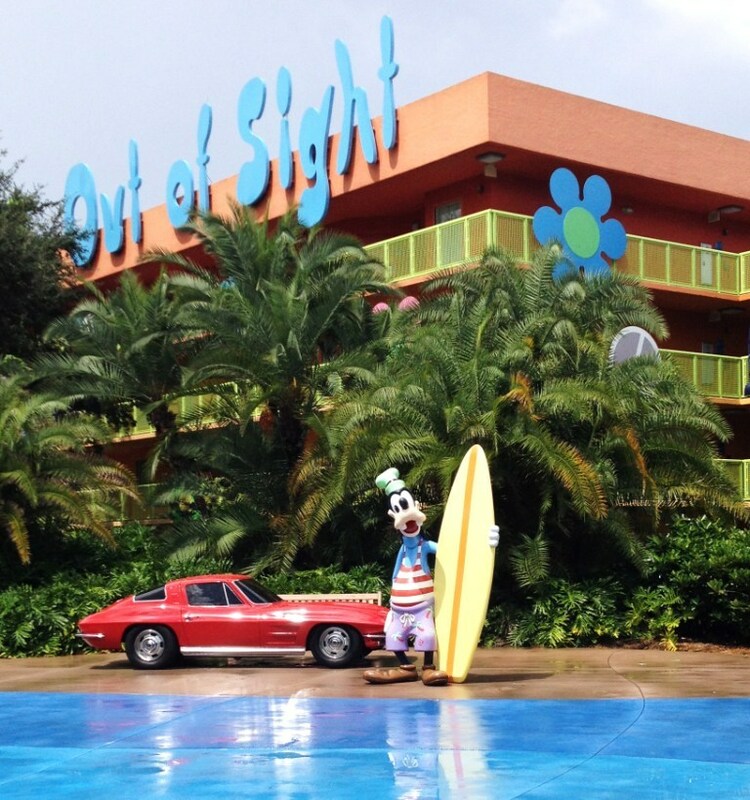 Pop Century opened in 2003 and is a huge resort with 2,880 rooms. It is themed around American pop culture from the 1950’s to 1990’s and is very “Disney” without being in-your-face. Check out my full review of the resort here. 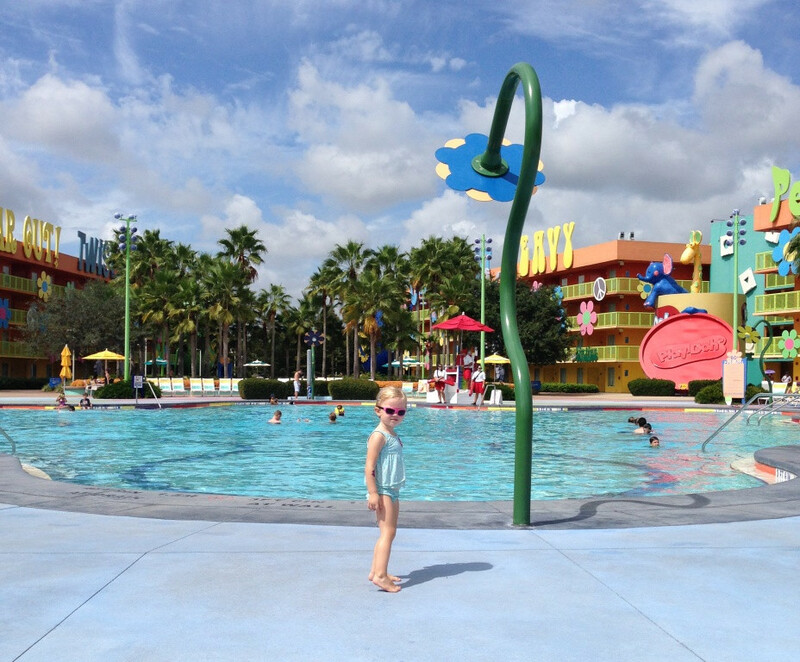 Pop Century has three pools and one fantastic zero-entry kiddie pool with bubbling water features. I particularly love the flower features at the feature “Hippy Dippy” pool. 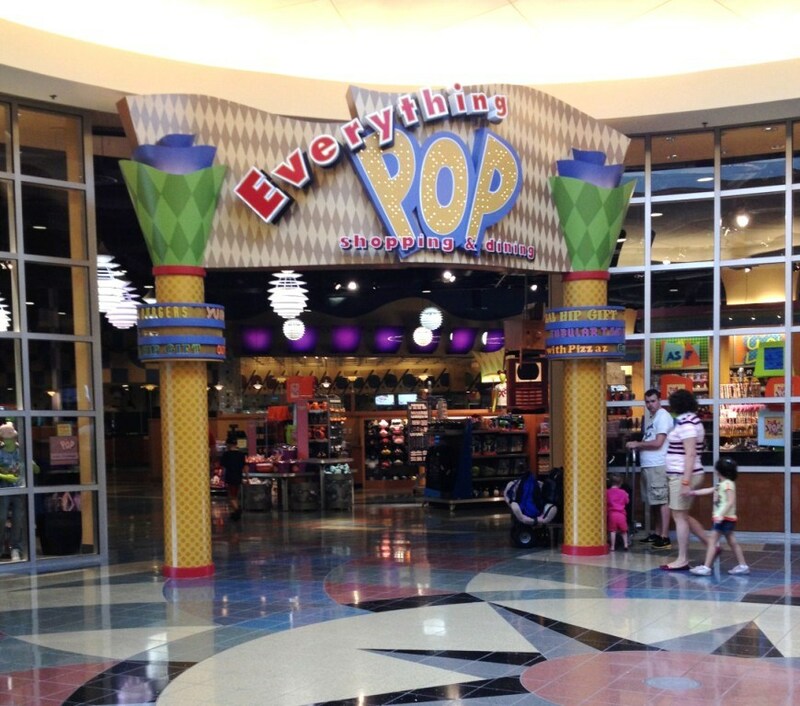 The gift shop and food court can both be found in the “Everything Pop” shopping and dining area. In my experience, the food court is a cut above the All-Star resorts. You’ll have more options and the quality is just a bit better. And here is a picture of one of the renovated rooms! It is hardly recognizable, right? The two double beds have been replaced by a queen bed and a queen-sized Murphy bed that transforms into a table. There are coffee makers in the new rooms, as well as a huge TV and a sliding wooden door that separates the bathroom area from the main room. You can check out my photo tour of the new rooms here. 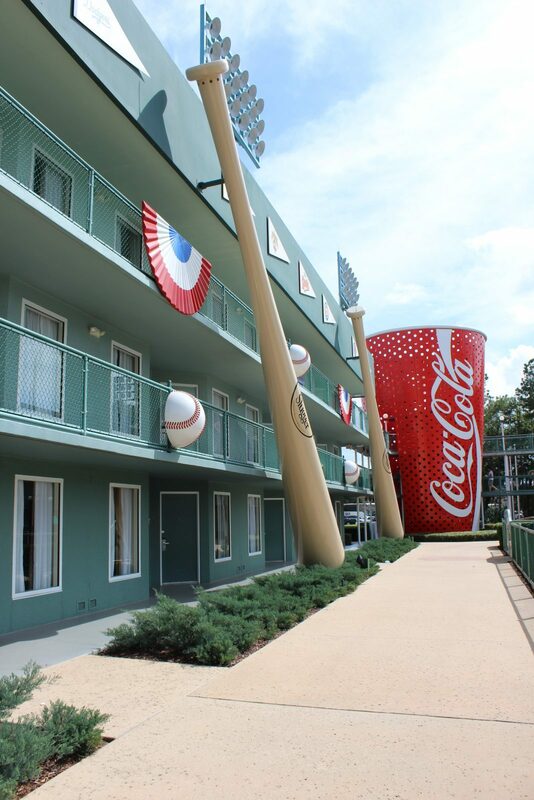 Needless to say, this renovation puts Pop Century a giant step above the rooms at the All-Stars. 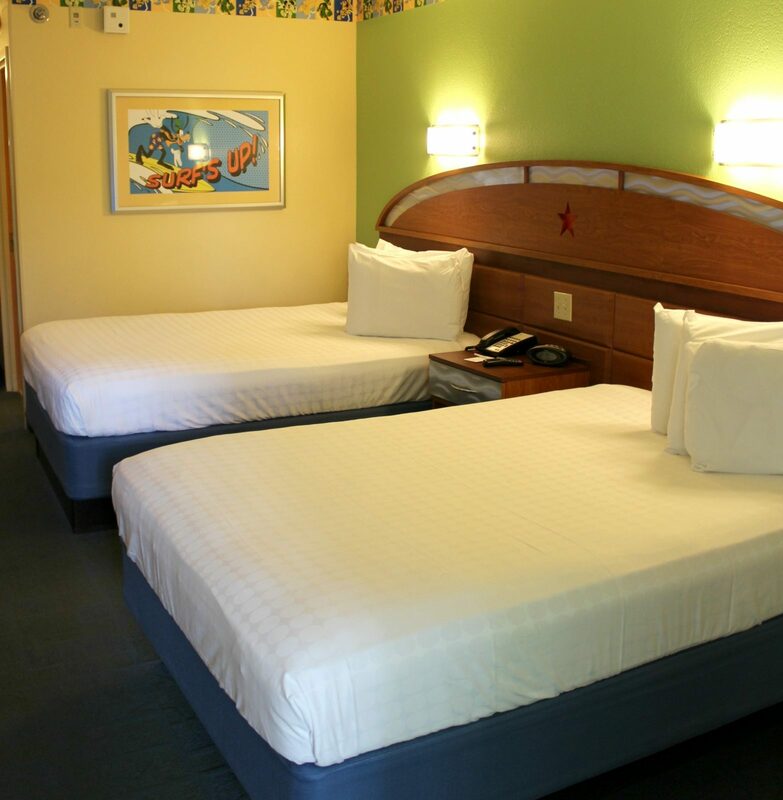 You are a family traveling with one or two small (7 and under) kids, I would suggest a room at Pop Century over all other Value Resorts and most moderates. There are four different room categories you can book at Pop Century: Standard, Pool View, Preferred, and Preferred Pool View. Pop Century is huge and spread out, so if you want to avoid long walks I suggest spending a little more and booking a Preferred room (these are closest to the main building). My second pick for the best Disney Value resort is Art of Animation. 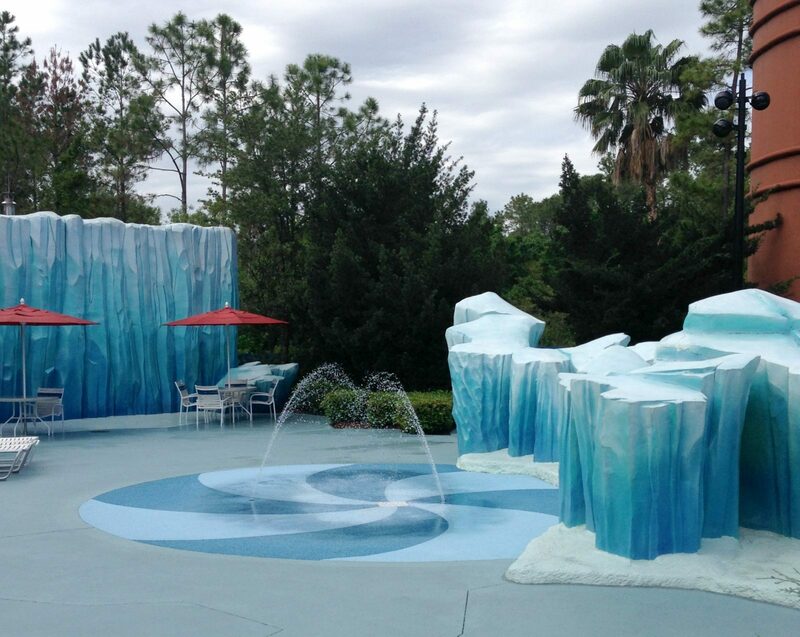 Disney’s Art of Animation is the newest Value resort and opened in 2012. It is located on the other side of Hourglass Lake, across from Pop Century. It takes less than 10 minutes to walk from the main building at one resort to the main building at the other. 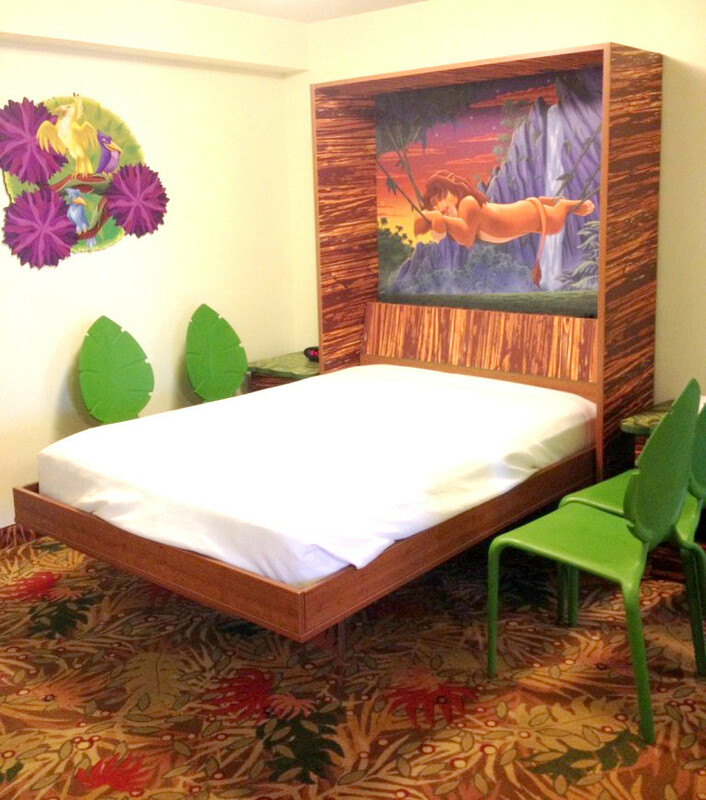 While all of the rooms at Pop Century are standard hotel rooms, most of the rooms at Art of Animation are two-room “Family Suites” that sleep up to six. 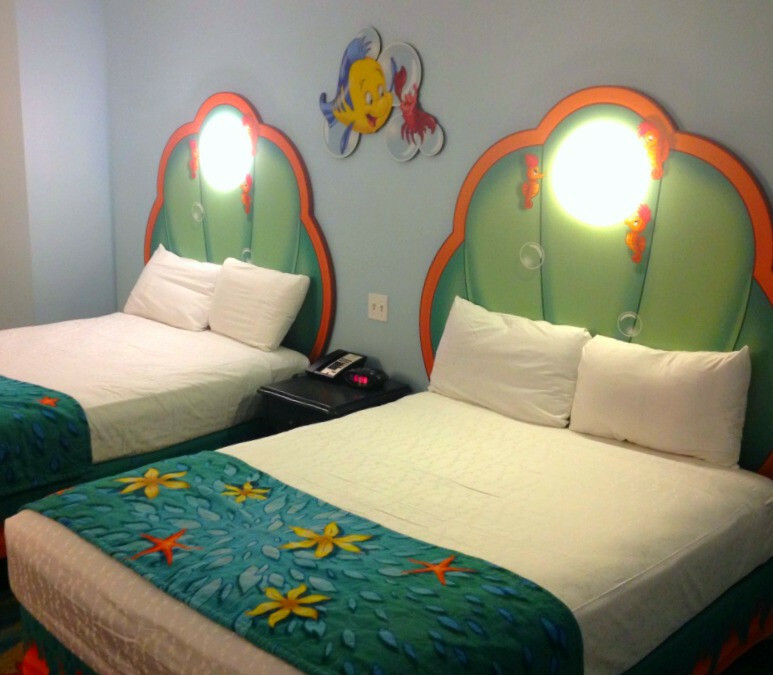 There are some standard hotel rooms at Art of Animation in The Little Mermaid area (read my review of these rooms here). Because they are located the farthest from the main building and are usually excluded from Disney-released discounts, I prefer rooms at Pop Century to these rooms. The family suites at Art of Animation feature two full bathrooms and a separate bedroom with a queen bed. They also have a table with four chairs that converts to a full-size bed, and a full-size sleeper sofa in the living room area (see lots of pictures of these rooms in this review). 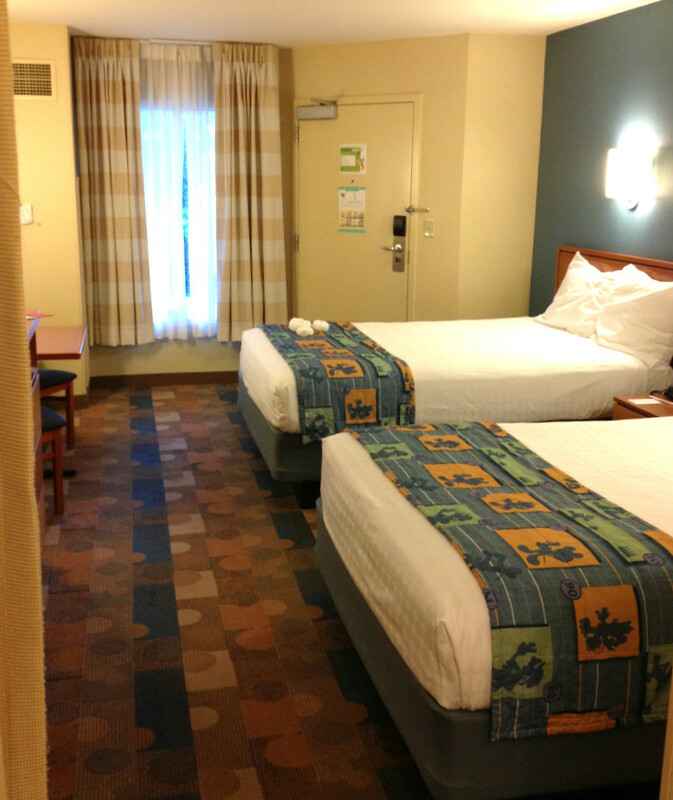 The one big downside of these rooms is their cost – the starting rate with no discounts is $354. 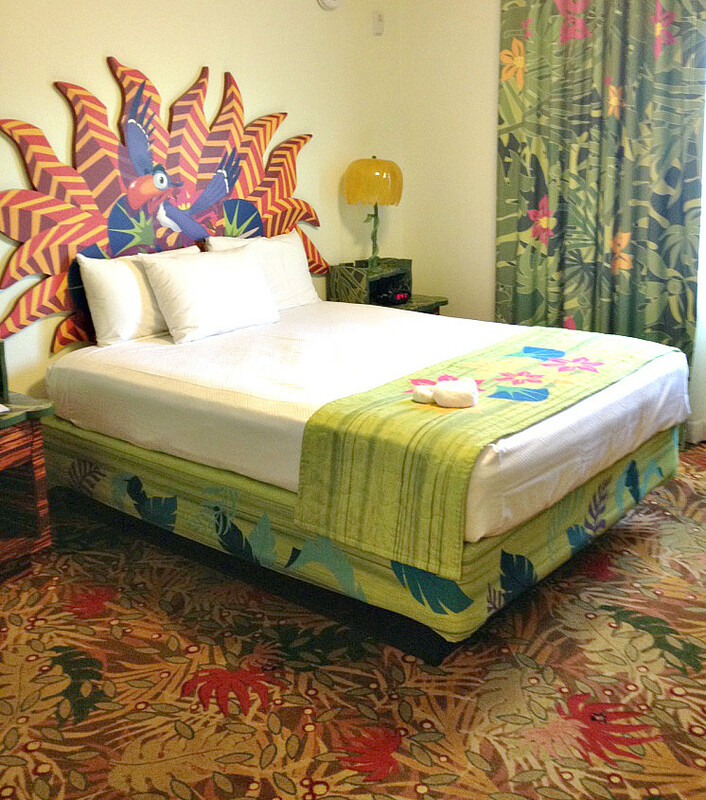 Discounts of up to 20% are common, but the cost still comes out to be much more than two rooms at another Value resort. These rooms are perfect for a larger family, or a family traveling with a grandparent. I think one adult could comfortably sleep on the Murphy bed, though I wouldn’t recommend putting two adults on the bed or any adults on the sleeper sofa! The pools at Art of Animation are fantastic, especially the “Big Blue Pool” which has a zero-entry side and large splash play area. The Cars area with these Cozy Cone cabanas is also really fun. The theming in the Cars area (and around the whole resort, really) is outstanding. 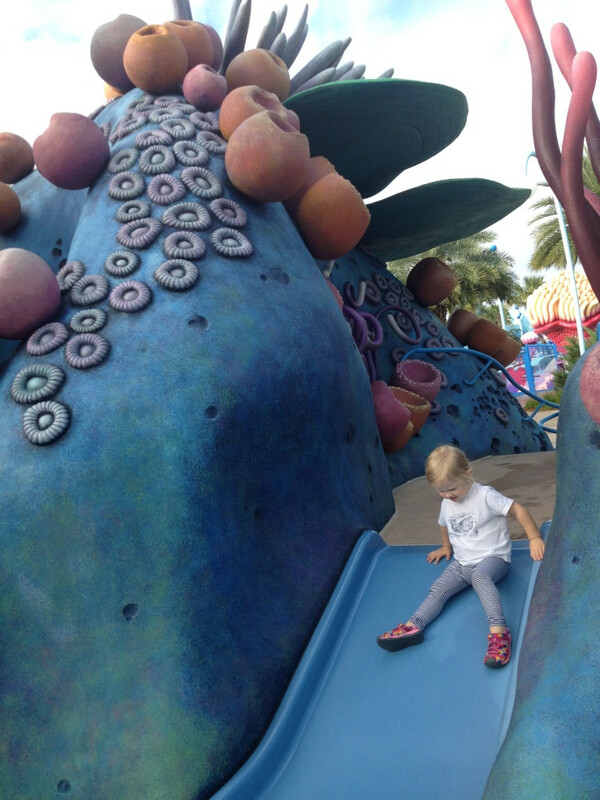 Even the playground area is themed to the movie Finding Nemo. My daughter loves playing there. The Landscape of Flavors food court offers a great selection and affordable prices. It is by far my favorite Value dining option, and I’ll often walk over to dine at Art of Animation when I am staying at Pop Century. Art of Animation also has covered waiting areas for the Disney buses, which no other Value resort has. I really appreciate not having to wait in the sun or rain! Overall, the amenities at Art of Animation are far superior to those at the other Values. I still prefer Pop Century if I’m traveling with a small group, thanks to the better value and room locations. When I’m trying to visit on a tight budget, the Disney Value resorts almost always come out ahead compared to staying off-property. Plus, I think you’ll have a far better vacation experience – i.e. more relaxation and time with your family and less stress! If you want help choosing the right resort or with any aspect of planning your Disney vacation, I strongly suggest getting a free quote from the expert agents at Destinations in Florida. 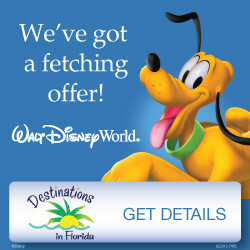 They can help you get the best price, book dining reservations, select FastPasses and more – all at no cost to you! 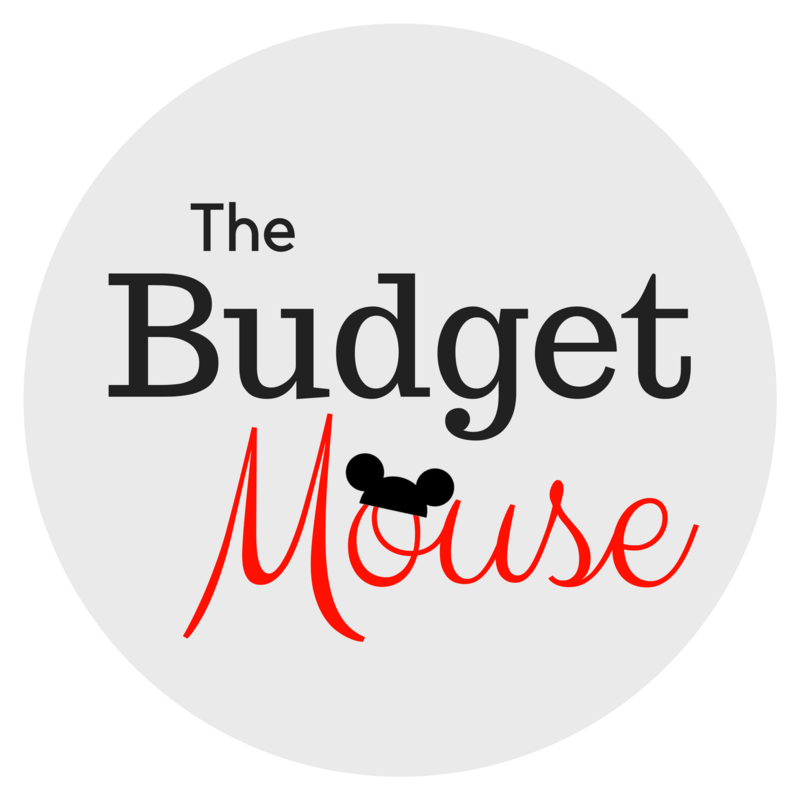 If you have any questions about the best Disney Value resort, please leave a comment below or join the discussion on my free private Facebook group! And if you can’t decide when to visit, you’ll want to check out this post on the best times to go to Disney World. 5 Reasons to Book Your 2019 Disney World Vacation Now! We just got back from Disney and stayed at All Star Movies. It was TERRIBLE! We go every year and stay at a different resort each time. This was the first for ASM. It will also be the last! Check-in time is 3:00, but our rooms have always been ready much earlier when we’ve checked in early. Not here. It wasn’t even ready by 3:00. It was after 3:30 when I finally got the text. And I’d paid for a preferred room and asked for one close to transportation and the lobby because I’m disabled. I know they don’t guarantee special requests, but I’ve always gotten a room close to transportation when I’ve requested it. We did get a preferred room because I had paid extra for it, but not one close to the bus stop or the lobby. It was at the far end of the back Toy Story building. We didn’t have two beds and a small table. We had two beds OR a small table! The 2nd bed was a Murphy bed, so if you wanted the bed, you lost the table. If you wanted the table, you had to put the bed up. When the bed was down, there was only a walkway from the door to the bathroom. The room was SMALL. The room also had a connecting door to the room next door. Thanks to that, we could hear everything our neighbors said….word for word. One day they started fighting and it went on forever. I finally had to call the Front Desk because 30 minutes later they were still screaming at each other and the woman was flinging the F word every other word. It was so bad that the woman at the front desk could hear them on the phone. They would have changed rooms for me, but none were available, so we had to stay where we were. I also didn’t like sharing the bus with the other two All Star resorts. The only time we didn’t have to do that was at park opening and closing. All Star Movies is the last stop of the three resorts. And this might sound odd, but I found the people staying at that resort were a lot more rude and inconsiderate than the people we’d encountered at Art of Animation or any of the moderate resorts. I was amazed at how nasty some were (including our fighting neighbors). It definitely made for an unpleasant stay. Mousekeeping was pretty much nonexistent. On our fourth day there, we had to ask for towels because our room had only been serviced once. It was so bad that not only will I never stay at that resort again, I won’t even stay at any of their value resorts for fear of the same bad service, tiny rooms, and thin walls. Uuugh, I am so sorry about your bad experience at Movies. I’ve personally never had any of these things happen, but I can totally see how all of this happened. The walls are thin (the case at all of Values, I’m afraid) and the rooms are definitely small. I personally liked the flexibility of the Murphy Bed because it meant the rooms now have queen beds (formerly full size which is a tight fit). It is unusual that your room wasn’t ready on time and I’ve had issues with not getting the texts when my room was ready so it could have been that, too. Hope you have a better experience next time at a Moderate or Deluxe. Anybody know the best place to rent DVC from? 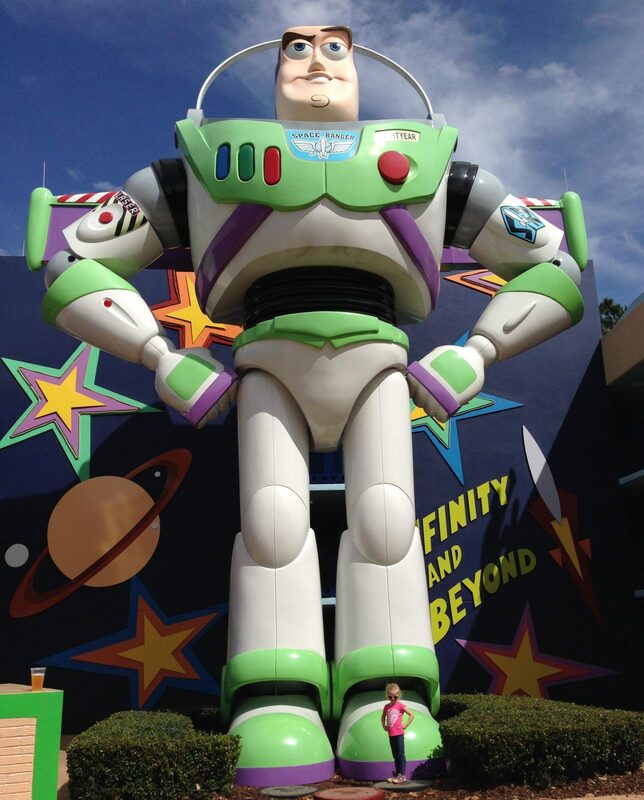 W stayed at Pop Century for 7 nights in July, a very busy time of the year and with the opening of Toy Story Land. 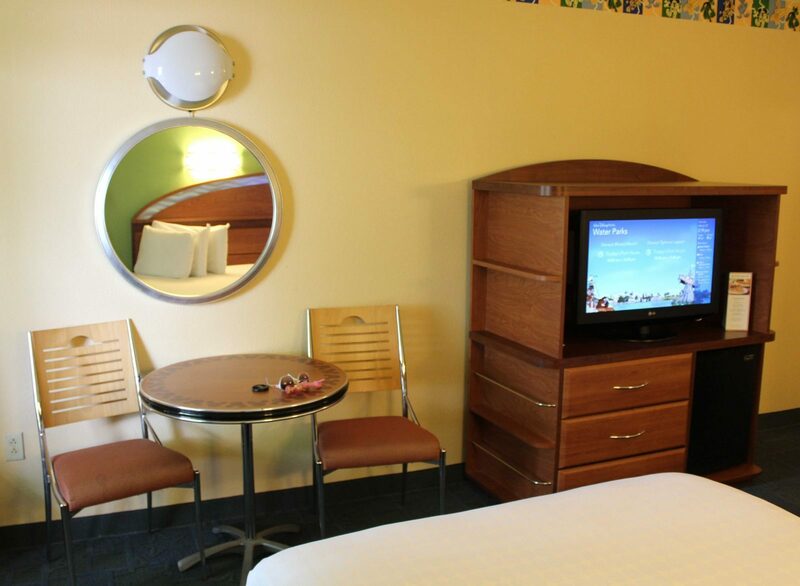 Having stayed at Pop Century 2 previous times in the old style rooms, we LOVED the remodeled rooms. The Murphy bed/table combo gave us a table while my son’s family used theirs as a bed for the two boys. I appreciate having the in-room safe, which is roomy enough to hold a laptop computer, and the in-room coffee bar is a wonderful addition. We stayed in Preferred Pool View rooms on the ground level. The grandsons loved being steps from the Hippy Dippy Pool and very close to the main building/food court/transportation. Will definitely stay at Pop Century again and it will even be better when the now-under-construction Skyliner Tram gets finished! I loved reading about your stay at Pop Century, Cheryl! It is such a great place and the new rooms make it even better! I agree – once the Skyliner is up and running it will be a hot ticket. Many don’t realize the extra benefits you get for staying on property beyond the known things like the dining plan and the transportation. All of the resorts, no matter if it’s a value or a deluxe, offer all sorts of things for the kids to do. There’s always activities poolside that even the grownups can join in if they want. When we stayed at Art of Animation, they had a tie-dye T-shirt activity. You paid for the plain T-shirt and a cast member made the first tie in it to show the kids how to do it. Then the kids were free to tie wherever they liked on the shirt and dip in whichever color dyes they chose. Then the cast member wrapped it tightly in plastic wrap and instructed the kids to leave it in the wrap for 24 hours, then rinse thoroughly. Imagine our surprise when we got home, unwrapped the shirt, rinsed it, and saw Mickey’s head in the middle of the shirt! (That was the first tie made by the cast member. I can’t remember what Port Orleans – French Quarter, but when we stayed at Coronado Springs, they had art-related activities in their gift shop on certain evenings. And that’s on top of the movies under the stars, the toasting of marshmallows, and the awesome swimming pools! Keeping kids busy, happy, and entertained? PRICELESS! The Finding Nemo pool at Art of Animation is AWESOME! 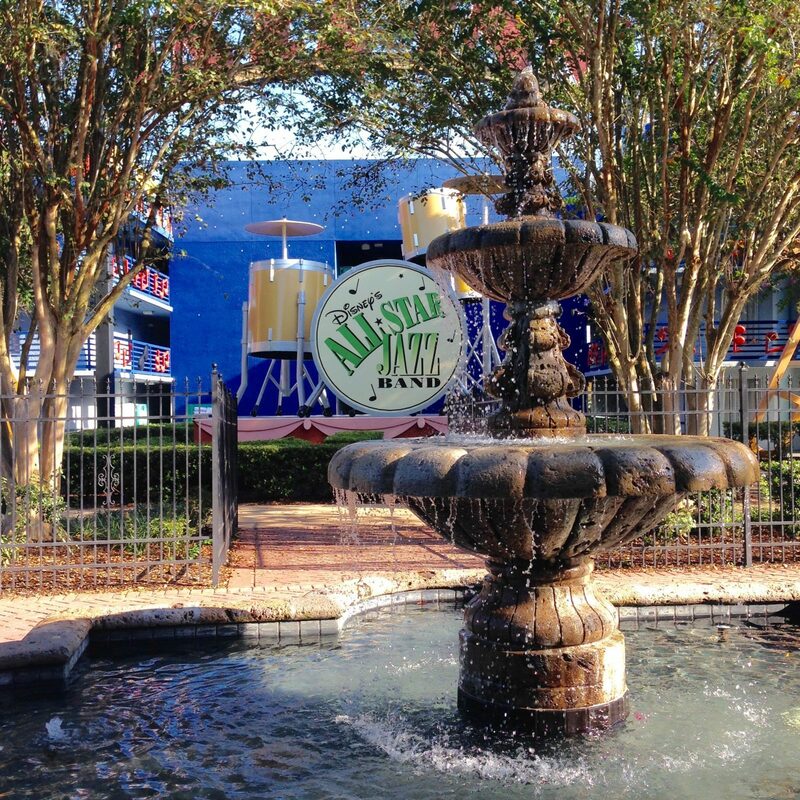 When we stayed at Port Orleans French Quarter on the next trip, I was really disappointed because of having stayed at AoA first. And the suites really are great. But FYI, if you need a bigger room, stay at a Disney Deluxe Villa. 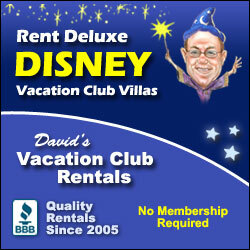 Rent from a DVC owner and you’ll find the cost is affordable. This year we’re staying in a Preferred Studio at Saratoga Springs for 4 nights for a little over $500. Rates vary, of course, by resort, room size and time of visit, but still. Why stay off property if you can stay on it for about the same cost AND get the benefits like the free Magic Bands, transportation to and from the airport, transportation around the Disney World resort, option to get the Disney Dining Plan, the 60-day window for FastPass reservations, AND the 180-window for restaurant reservations. I wouldn’t trade it for the world. Yesssss, Peg! I feel so bad when people stay off property and pay more than renting points and have a terrible visit. 🙁 Renting DVC points is the best deal! Maybe “Herbie the Love Bug” is meant to appeal to older people (like grandparents, maybe). To me, Herbie is definitely a classic – when I was a kid, it was a big deal to watch Disney on TV on Sunday nights. Fond memories would make me want to request a room in the “Herbie” section! While I absolutely adore staying on site I have to say I get more bang for my buck off site. We are annual pass holders so parking cost is not an issue, and we live only 6 hours away. We booked a 3 bed 2 bath condo with a pool during peak for only $700 for a week! It really is huge advantage to have a full kitchen, and a washer/dryer at my disposal. The condo was only 10 minutes from ttc. I also just love being able to go to my car, crank my AC, and leave when I feel like it. Sometimes waiting for the bus with 2 cranky girls, and a cranky hubby, is more trouble than it’s worth….lol! You are totally right, Kristin, you can get more space for the money off-site. When I am going to have access to a car anyway and am on a short trip with a tight budget, I have stayed off-site. It’s just a totally different experience of Disney World compared to staying on-property, you know what I mean? Thanks for reading and sharing your experience! Also, I’d love to know where you stayed if you liked it! I can’t remember if that one was through godisneyvacation.com, or homeaway.com I love both sites…lol. 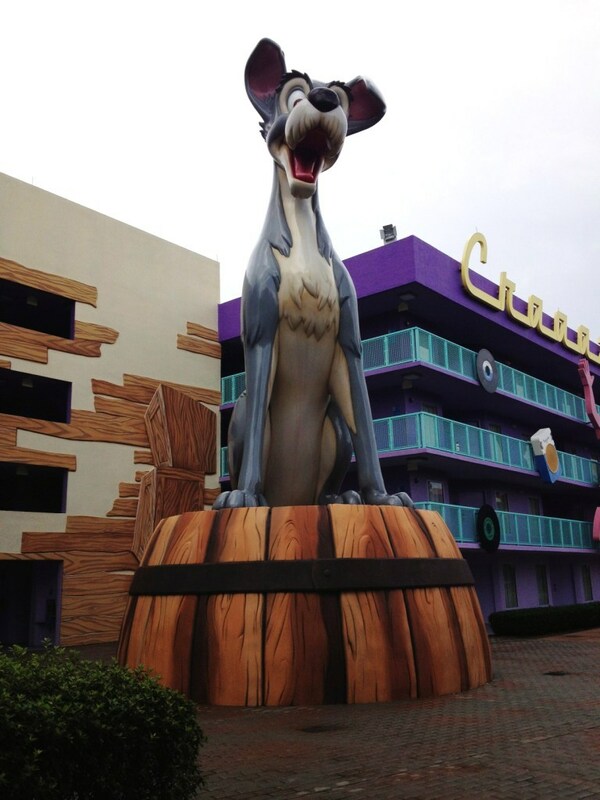 We’ve recently booked again with godisneyvacation, because they’re condos are super clean, and affordable. We ended up doing a week at Disney during 12/16-12/21. We go a 3 bed 2 bath cutie for $700. Pricey I know, but has the amenities I need. A full kitchen, and laundry. I love my kids, and the hubs, but they do make a mess of their clothes at times…lol. Plus, sometimes it’s nice to have a quiet cup of coffee, or tea as I am trying to come down from my Disney day….lol. Also, I find our family of four cannot deal with sharing a single toilet/shower. When a kid has to go they have to go…lol. Plus, I sometimes feel like being close to a drugstore, or a decent offsite restaurant is crucial to my Mom sanity. Hope this helps you if you decide that maybe off-site is something cool you’d like to try. Thanks so much Kristin! 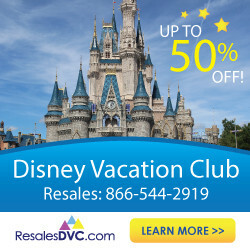 I have never heard of go disneyvacation.com so I am checking their site out now. I’ve stayed off-property many times but have never rented a condo or timeshare. Something to consider! And I’m with you on not being able to share a bathroom with four people, especially in a Value resort! I haven’t stayed at All-Star Movies in quite some time. Thanks for the reminder of how fun the resort can be! 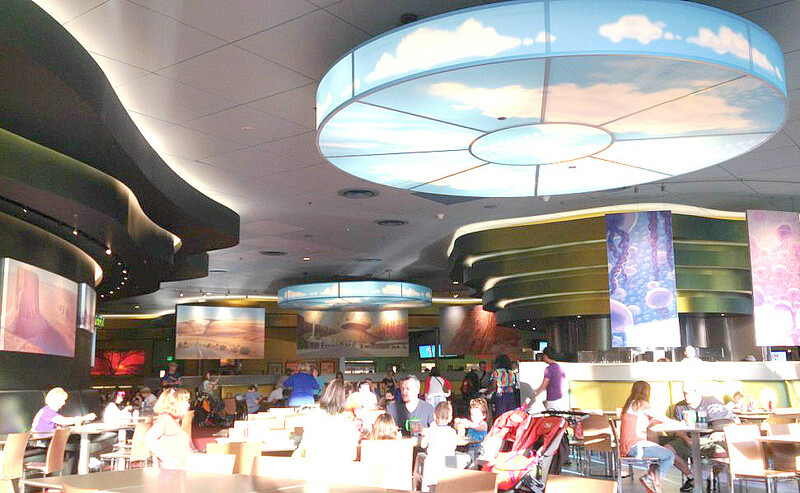 Pop Century is a great option due to the renovated rooms. I love the bigger beds. Thanks for sharing my post and pictures. Can’t wait to stay in a “new” Pop Century room! I tried to get there for a night on our trip next week but it was booked!